Are all of your pool screen panels secure? Any which have started to come away from the frame, or have become brittle after years of exposure to the sun, are likely blow out if we get any severe wind or rain. It is far less costly to repair the existing screens than to replace them entirely. We can provide you with very competitive prices for screen replacement and repair, including discounts for multiple panels. 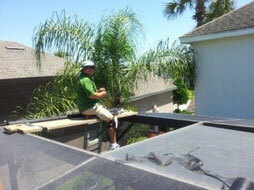 Below are a couple of images of Jim & Steve from a recent job, when we replaced all the panels on a pool screen roof. The old panels were so brittle, they literally fell apart in our hands as we were removing them. We are out and about fixing a lot of screens, including roof panels. One phone call and we can have it done for you too. 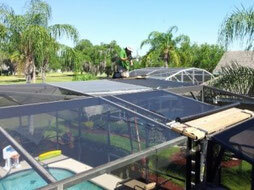 Call us at 407-456-1369 if you want to make sure your pool screen stays put during this upcoming storm season.